The humble office doesn’t always feature prominently in RIBA’s annual Stirling Prize list but last night, Bloomberg’s European headquarters was named the UK’s best new building. The 2018 RIBA Stirling Prize judges were unanimous in their decision to award Bloomberg the 2018 RIBA Stirling Prize describing it as a “once-in-a-generation project”. RIBA President, Ben Derbyshire says it is a “monumental achievement”. It’s the second award bestowed on the project in the last week. The BCO has already declared the building the UK’s best workplace. It’s fair to say that prominent commentators in the architectural world were not massively impressed. Tom Dyckhoff wrote on Twitter “YOU MUST BE JOKING??!??!?”. Writing in The Guardian Olly Wainwright said, “it is hard to escape the feeling of being trapped in a very deep-plan office building, very far from a window, with views to the outside world often obscured by the big bronze baffles”. Thought to be the largest stone building in the City of London since St Paul’s Cathedral (c. 1675), Bloomberg is claimed by RIBA to be a state-of-the-art project which has pushed the boundaries of research and innovation in architecture. Even though Foster + Partners originally obtained permission to design a building over double the height, Bloomberg sits at a much more appropriate scale – at a modest ten stories – and seeks to create a dialogue with the City that surrounds it. This scheme also incorporates new access to Bank Underground station, cafes and restaurants, and a museum displaying the Roman Temple of Mithras, which was discovered on the site sixty years ago. 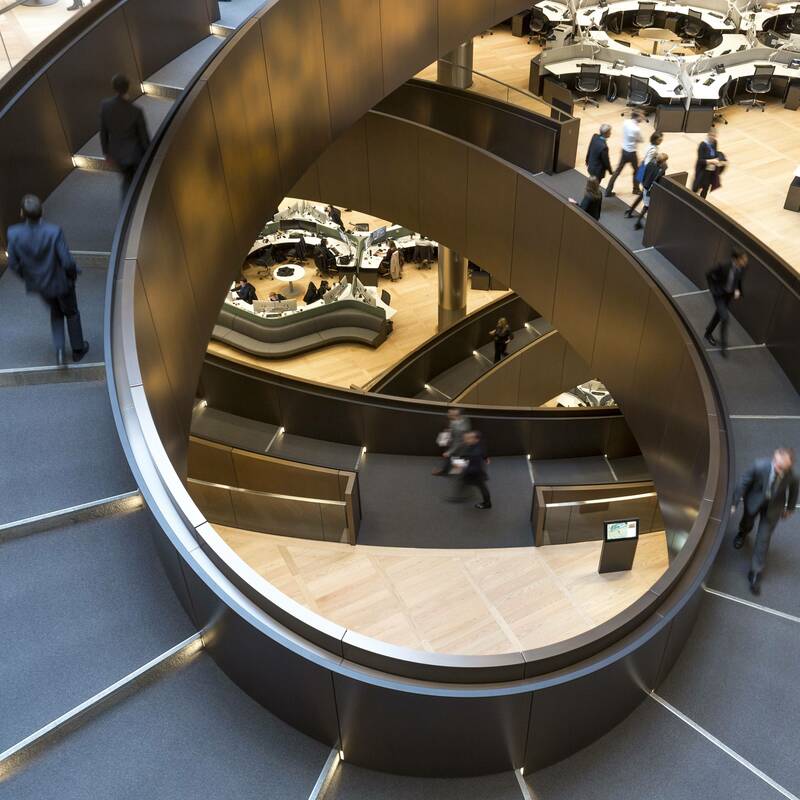 Unlike most offices, instead of a large central core formed of lifts and staircases, Bloomberg’s services are pushed to the edge and the people form the core of the building. Visitors pass through the reception lobby before being drawn into the ‘Vortex’ – a double-height space created by three curved timber shells. From here, high-speed lifts carry people directly to the sixth floor ‘Pantry’ – a large concourse and café space with views across the City. A 210m high bronze ‘ramp’ that is wide enough for impromptu conversations without impeding the flow of people, winds down and links the office floors below. Workspaces are clustered in the wide open-plan floors which are filled with pioneering new technologies including multi-function ceilings fitted with 2.5 million polished aluminium ‘petals’ to regulate acoustics, temperature and light.